(Nanowerk News) Researchers from the RIKEN Center for Emergent Matter Science in Japan have uncovered the first evidence of an unusual quantum phenomenon--the integer quantum Hall effect--in a new type of film, called a 3D topological insulator. In doing this, they demonstrated that "surface Dirac states"--a particular form of massless electrons--are quantized in these materials, meaning that they only take on certain discrete values. These discoveries could help move science forward toward the goal of dissipationless electronics--electronic devices that can operate without producing the vast amounts of heat generated by current silicon-based semiconductors. 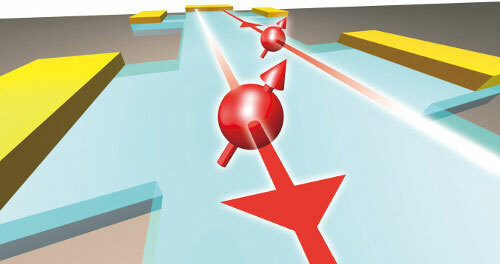 Schematic showing the integer quantum Hall effect on the surface of a topological insulator. The effect allows dissipationless current, without energy loss, along the edge of the material. Topological insulators are an unusual type of material, which do not conduct electricity in the inside but only on the surfaces. Their surfaces are populated by massless electrons and electron holes--known as Dirac fermions--which can conduct electricity in a nearly dissipationless fashion, like a superconductor. As a result, their properties are being studied in an intense way with the hope of creating low-power consumption electronic devices. However, impurities in the crystal structures of these topological conductors have, up to now, made it difficult to realize this potential. 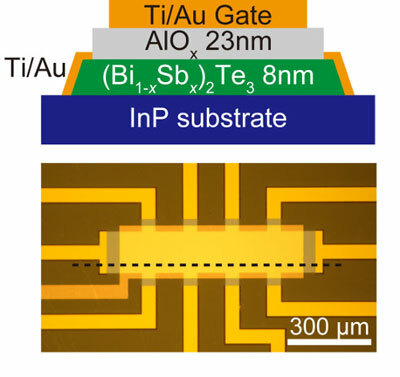 In the current research, published in Nature Communications ("Quantum Hall Effect on Top and Bottom Surface States of Topological Insulator (Bi1-xSbx)2Te3 Films"), the group was able to overcome these limitations through careful engineering of the material. The group fabricated a 3D topological conductor made from bismuth, antimony, and tellurium, successfully eliminating the impurities that have plagued previous efforts. By fixing the material on an indium phosphide semiconductor substrate and then placing an insulating oxide film and electrodes on top, they transformed the films into electric gating devices known as "field effect transistors," and measured the Hall resistance, a type of electric resistance, while tuning the strength of the electric field, using a constant magnetic field. By doing this, they were able to show that the resistance became constant at certain plateaus, demonstrating the presence of the quantum Hall effect in the material. Cross-sectional schematic and top view photograph of the Hall bar device used for the topological insulator. The broken line in the lower panel shows the position of the film shown in the upper panel. In addition, by tuning the external voltage placed on the films, they were able to show that the Dirac states could be switched between the integer quantum Hall state and insulating state by changing the electrical current. According to Ryutaro Yoshimi of the Strong Correlation Physics Research Group, who led the research, "It was very exciting to see this exotic effect in a 3D topological insulator, and we plan to continue our work to show how materials can be finely tuned to have various electronic properties. In the future, these results could I hope be used for the creation of high-speed and low-power-consumption electronic elements."